Happy Thursday everyone! Robin here with my inspiration design of the week for Dies R Us! This week will be my last weekly post for the Dies R Us inspirational blog but I will continue with the Dies R Us Challenge Blog! In my place will be Diane Hover, who is a great designer and I am sure her projects will inspire you! My design for this week started when I received this beautiful die set, Spanish Collection-Cordoba by Sue Wilson! I created an A7 top fold card base from white card stock. Then cut with the two larger dies from the set using white card stock. 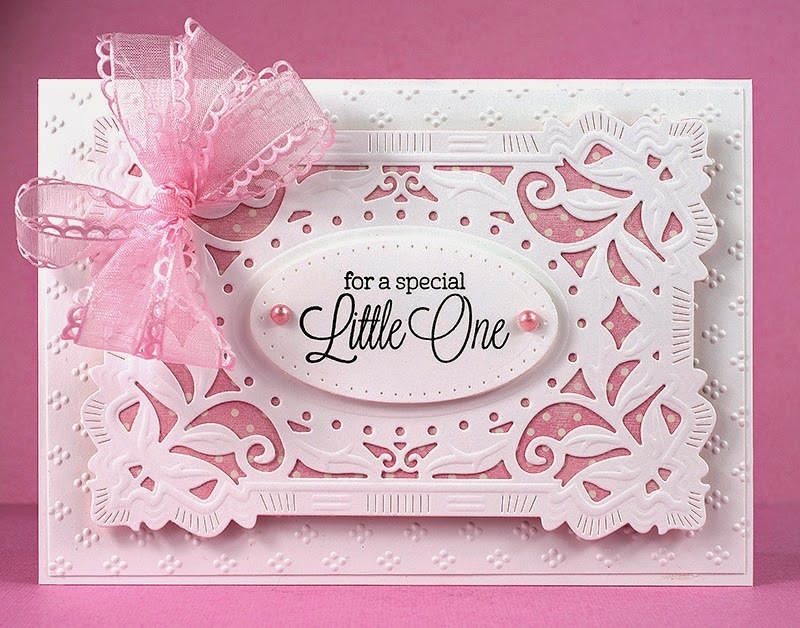 I then cut, from a pink polka dot paper, using the largest die only, to create a background for my white die cut. I adhered the die cut to the background using liquid glue. I then embossed a piece of white card stock, cut slightly smaller than my card base, using Spellbinders EG-002 embossing folder and added to my card base. I made a three loop bow, added to my die cut and adhered to my card base with foam pop ups. The sentiment is stamped onto the oval from the side set and added to card with more pop ups. To finish the card I added pearls to my sentiment tag. I hope you will check out all the Sue Wilson dies...they are to die for! Be sure to stop by the Dies R Us challenge blog, they have a new challenge starting the 1st and 15th of each month! It's easy to enter and you just might win a Dies R Us gift card! Oh Robin this is just GORGEOUS!!!! 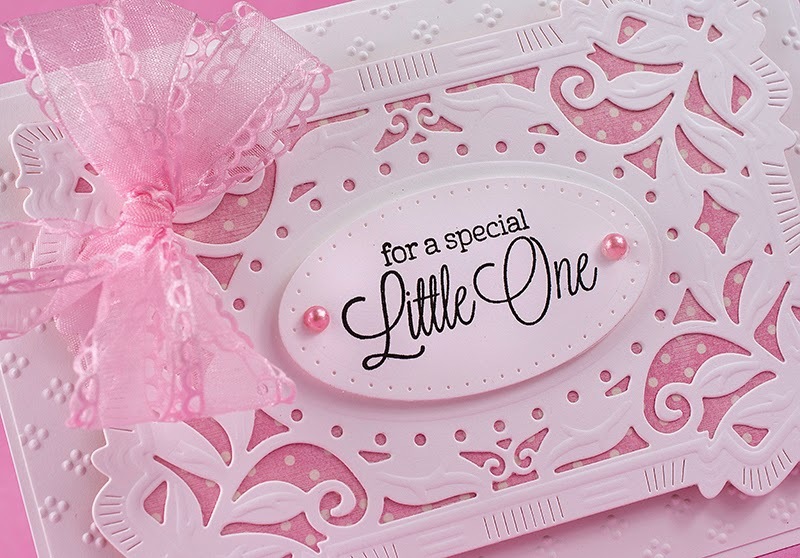 This is probably one of my favorite dies & you have created a beautiful baby card with it! That gorgeous bow just finished it perfectly! Robin your card is gorgeous, so delicate and pretty...and the ribbon is beautiful...I can see I will have some big shoes to fill here!!! At least we will get to see you at the DRU challenge blog...!! !